Who's Protecting Whom From Deadly Toxin? : Shots - Health News Last year a scientist said he'd found a new form of botulinum toxin, and was keeping details secret to keep the recipe from terrorists. But other science and public health labs were shut out, too. 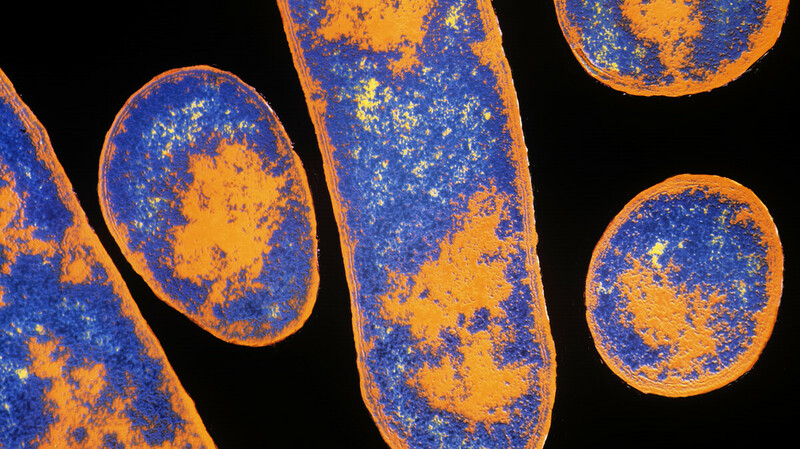 Botulism bacteria, or Clostridium botulinum, grow in poorly preserved canned foods, especially meat and fish. The microbe's toxin could be lethal as a bioweapon. Questions are swirling around a science journal's decision last year to publish a description of a newly discovered botulinum toxin while omitting key genetic details that researchers would normally disclose. The unusual case highlights important unresolved issues in how to balance scientific openness with the worry that biological information could potentially be misused. NPR has learned that the scientist at the center of this controversy has not been sharing materials and information with other botulinum toxin researchers — and for two years, he ignored entreaties from federal officials who wanted the microbe so that they could test vaccines and antitoxins. The scientist kept the genetic sequence secret, but federal officials did not recommend doing so. Some experts who have concerns about how potentially dangerous discoveries are dealt with in biology say this situation shows that it's still unclear what kinds of findings should be withheld from the public, who should make those decisions, and how to ensure that legitimate researchers will get access to the information so that science can advance and protect public health. Botulinum toxin, produced by bacteria, is the most poisonous substance known. For that reason it has long been considered a potential bioweapon. The federal government even stockpiles antitoxins against the known toxin types, in case of a terrorist attack. So it was big news last October when scientists announced that they'd discovered the first new form of botulinum toxin in more than 40 years — a toxin they called "type H" that they said could not be neutralized by the available treatments. Scientists led by Stephen Arnon at the California Department of Public Health made the surprise find in a clinical sample from a baby who had been sick with infant botulism. Editors for the Journal of Infectious Diseases agreed to Arnon's request that the papers not include the genetic sequence for the novel toxin because of fears it could provide a recipe for a bioweapon. In an editorial, the journal editors noted that Arnon had consulted with experts at multiple federal government agencies before publishing. In a statement provided to NPR Monday, the California Department of Public Health made it clear that federal officials had not asked Arnon to withhold the genetic data. "While the Department indicated to the media that this decision was made at the behest of federal agencies, we now know that this is not the case," the agency's director, Ron Chapman, said in the statement. "The Department is committed to accuracy in all of its communications with the public and regrets the error." NPR asked to speak with Arnon, but a spokesman for the public health department said Arnon would not be available for an interview. NPR sent detailed questions to the agency and Arnon on April 16. As of 5 p.m. Monday, California time, we'd received no response to those questions. On May 29, 2012, Arnon met to discuss this newly discovered toxin with representatives of government agencies including the National Institutes of Health, Centers for Disease Control and Prevention, Department of Defense and Federal Bureau of Investigation. "It is my understanding that there was no recommendation from that committee to withhold the sequence," says Robert Tauxe, deputy director of the division of foodborne, waterborne and environmental diseases at the CDC. But there was one thing that federal officials did want: the microbial strain that made the toxin. "Sitting around the table, I think this was the request of everybody from the government ... 'Can you provide us with the strain?' " says Leonard Smith of the U.S. Army Medical Research Institute of Infectious Diseases. He explains that officials wanted the strain to evaluate whether stockpiled therapies or vaccines in development would work against the toxin. "And I think that started the problem," says Smith. "Because Dr. Arnon was very reluctant to release it." Internal emails obtained by NPR under the California Public Records Act reveal the frustration of government officials as their requests resulted in no action. "It's time for us to revisit the issue of making available your novel [botulinum] strain for USG [U.S. government] evaluation," Michael Kurilla, director of the Office of BioDefense Research Affairs at the NIH, wrote to Arnon in September 2012. "At this point, I have exhausted my internal resources to constructively engage with you on this topic. ... If you are prepared to share your strain (and I do mean a live strain, rather than an extract), then let us proceed. On the other hand, if we are merely to continue with unproductive conversations and more letter writing, I will simply declare defeat on my part to address what may represent a potentially serious vulnerability to a biothreat agent that had been previously considered adequately addressed." The CDC first requested that Arnon send them the strain in 2011, an agency spokesman told NPR. The agency did not receive it until January 2014. Now that CDC researchers finally do have access to the strain, important work can begin, says Tauxe. "The bottom line for us is, there's a lot more science to be done still," says Tauxe, "with questions that are still open about just how does this toxin differ from the standard known seven toxin types. ... Will the existing antitoxin that we have here in the United States protect against it, or not?" "I wish we had received the information two years ago, 2 1/2 years ago. We could have had a jump on things," says USAMRIID's Smith. "Later is better than never." And it wasn't just key government agencies that Arnon shut out from working on the novel toxin. Other botulinum experts say they also tried to obtain the strain, after the scientific papers describing it were published in October. Researcher Andreas Rummel of Hannover Medical School in Germany says he repeatedly asked Arnon, both by email and at a scientific conference in Annapolis, to share the sequence with his lab and others that study botulinum toxin. "And he basically pointed out that I should go to Google and make a search for Iran and botulinum neurotoxin," says Rummel, saying that the implication was that the information could not be shared because of fears that scientists in Iran could use the information to produce a bioweapon. Rummel says he also had a long phone call with Arnon, and that Arnon referred him to Web pages of think tanks in Washington, D.C., that referred to the possible production of botulinum toxin as a bioweapon in Iran. "He was not willing to provide any even partial sequence of the strain. At least the release of a partial sequence would have helped to improve diagnostics worldwide," says Rummel, noting that without this information, laboratory tests would not be able to identify any patients sickened with this toxin. Asked if Arnon's fears about misuse of the information were warranted, Smith at USAMRIID replied, "I don't know." "I think that was a judgment call on Dr. Arnon's part," says Smith, who describes himself as a friend of Arnon. "I'm not going to say either way whether he was right or wrong. In his conviction, he felt that the way he handled this was the way it needed to be. He didn't want to be accused of putting information out there that could come back and harm the United States, and I have to respect his conviction and judgment on that." But Rummel doubts that just knowing the genetic sequence would let someone make a dangerous new weapon. The sequence would only allow scientists to produce a naked neurotoxin that would not be surrounded by various proteins that normally stabilize it. "I cannot see that this, from the technical scientific point of view, will pose any threat," Rummel says. Because Arnon did not publish the full genetic sequence, he notes, botulinum scientists have been unable to verify Arnon's work. "The question for me is, is this really a new serotype or not?" says Rummel, noting that it could just be a hybrid of already known toxin types. That question was echoed by another researcher whose requests for access to the strain or genetic sequence have been denied. Eric Johnson of the University of Wisconsin, Madison, has studied botulinum toxin for 30 years. He says at the moment, it's not possible to know whether Arnon really has discovered a novel toxin. In a recently published letter to the editors of the Journal of Infectious Diseases, Johnson wrote that "there are significant scientific concerns in the studies in that certain of the strategies and experiments performed were not decisive and definitive to define a new serotype of botulinum neurotoxin." "It is impossible to critically evaluate the novelty of a declared new serotype or potentially significant discovery when other laboratories do not have access to the materials and information," Johnson wrote. "The specialty of my lab is purifying toxins," Johnson told NPR. "If we had the nucleic acid we could clone the gene and express it and purify it and definitively study its characteristics." Editors of the Journal of Infectious Diseases said they sent Johnson's letter to Arnon at the California Department of Public Health and that he informed the journal that "the California Department of Public Health elected not to submit a reply." The journal editors, however, did respond to Johnson's letter, saying that when they accepted the manuscript with the sequence information withheld, the purpose was not to keep reputable scientists from obtaining useful information. They expected that the strains and data would be shared. David Hooper of Massachusetts General Hospital, one of the journal's editors, said that the journal had not been involved in the consultations with the government. The plan to publish without the genetic information had been Arnon's idea. "I think we made our best judgment," Hooper told NPR. But one outside expert who reviewed the research paper for the journal prior to publication advised against withholding the gene sequence, saying it would be "unprecedented" for the journal to publish a paper about a new gene and not provide the sequence. "Indeed, this paper provides little value for medicine, public health or biodefense efforts if the gene sequences are not provided," the reviewer wrote. This reviewer did agree that "the risk of nefarious use of the gene sequence outweighs its immediate release" but urged that the authors simply wait a year or two and publish the full information — after countermeasures against the toxin were developed. Federal officials generally seem to have supported publication of the research findings. One letter to Arnon says the government supported his submitting "any and all manuscripts" regarding this novel finding for publication. "While we appreciate that you recognized the potentially sensitive nature of these findings and solicited our input prior to submission, representatives from the intelligence, public health and scientific communities who have reviewed the available information believe these results dealing specifically with the discovery, isolation, identification, and characterization of this novel strain of C. botulinum should be published," senior science adviser George Korch of the Department of Health and Human Services wrote to Arnon in January 2013. "It was never our intention to prevent public dissemination of the discovery of this novel strain. In fact, I am aware of an endorsement for publication from the Centers for Disease Control and Prevention from over one year ago." In December 2013, Arnon was quoted by a newspaper, The Sacramento Bee, as saying that "the recommendations from the federal government were clear on the potential risks of publishing the gene sequence." The story was picked up by the AP and other news outlets. But after that story appeared, Arnon wrote an email to the editors of the Journal of Infectious Diseases and a communications consultant. He wrote that the newspaper's quote was "bogus" and not something that he had ever said or written. The federal government never made recommendations on the potential risks of publishing the gene sequence, he said. "I would appreciate any and all of you making clear to whomever may inquire that the federal government did not 'recommend' to CDPH that CDPH withhold the toxin gene sequence," Arnon wrote. Emails show that Arnon worried about keeping the genetic information secret. In a letter to the editors of the journal, he noted that anyone could request the genetic sequence under California's Public Records Act. Arnon encouraged the journal's editors to write an editorial supporting the decision to not release the sequence, noting that if legal questions about public access arose, "it would be very valuable to have the leading journal in infectious diseases clearly state that presently not releasing the sequence is the right and proper course to take." In another letter to the journal editors, he noted his concern that computer hackers would attempt to get the sequence information. He said his team had prepared for that by deleting emails that might contain sensitive information and making sure that no sequence information was stored on computer hard drives. One editor of a scientific journal says that the questions about information-sharing raised by this discovery will come up again and again in the future as researchers make other finds that raise potential security issues, and that the federal government needs to figure out how to provide guidance. Similar issues arose in 2012 concerning the publication of research detailing the genetic steps that could potentially make a bird flu virus transmissible through the air between humans. Papers describing that work were eventually published in full, after a long and heated debate among scientists, government officials, and security experts. "Editors are running into more and more papers in which there are concerns. And this is being handled ad hoc inside the journals," says Arturo Casadevall of Albert Einstein College of Medicine, who edits the journal mBio and serves on the National Science Advisory Board for Biosecurity, which advises the government on research that could be potentially misused. He notes that ultimate responsibility does fall on the scientists and the journals. "The problem is lack of sufficient expertise," says Casadevall. He and several other journal editors are now calling for the government to set up a national board that would evaluate scientific papers for potential security risks and make recommendations about whether information should be made public or kept secret. He says, however, that if research is identified as being too sensitive for public release, it's unclear how to ensure that scientists who need to know will get access. "This is an area where the jury's still out. Basically we have never faced these problems before in science and what we need is discussion and to come to a consensus on how these things are going to be handled," says Casadevall. "But right now, that doesn't exist." Updated 3:13 p.m. ET April 23: A California Department of Public Health spokeswoman reviewed NPR's report and said, "We don't have any information to add." She said the department does not plan to answer the questions submitted by NPR.